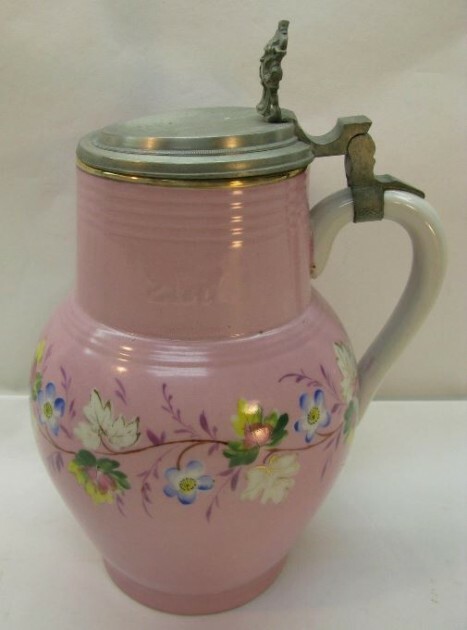 Shown: .5 liter milk glass stein with an applied pink-orange stain, applied enameled dots and hand painted. A very pretty example. Circa 1840. 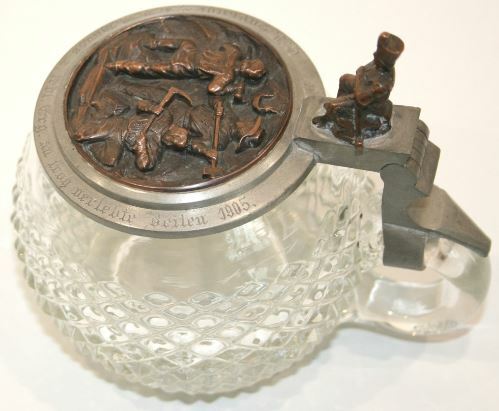 MINER’S ENGINERING STUDENT – HOBNAIL STEIN COPPER MOLDED THUMBLIFT. 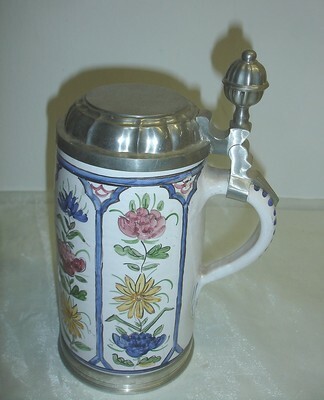 Miniature stein – Steins that are less than 3 inches in height. Lots of them are supposed to be salesmans’ give-aways. I have always doubted that, but can’t prove it one way or the other. 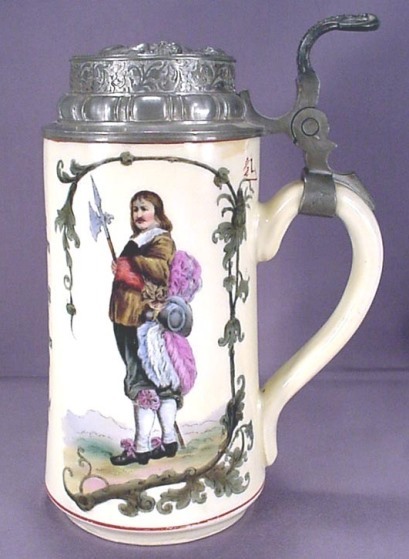 Miniature stein collectors do not consider “kinder steins and mugs” to be true miniatures! 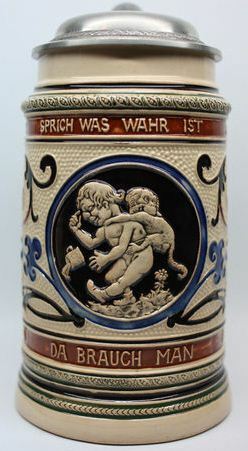 Shown below▼: A true miniature stein, hand made and painted in Scandinavia and less than 3 inches tall. Dated 1897! 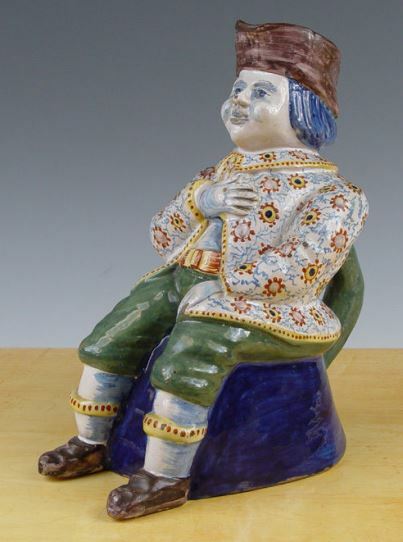 Minton pottery – Well thought of English pottery firm. based in Stoke. 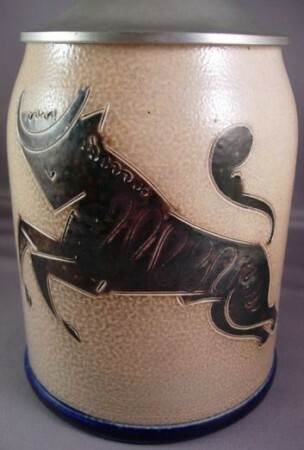 Producers of Porcelain and various types of earthenware under several different partnerships. 1793 to present. 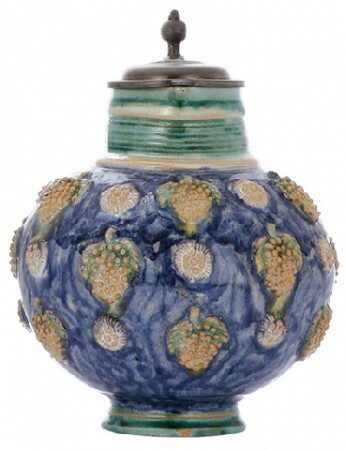 Shown above: A Minton relief 13.5 inch majolica server; usually expensive when found. 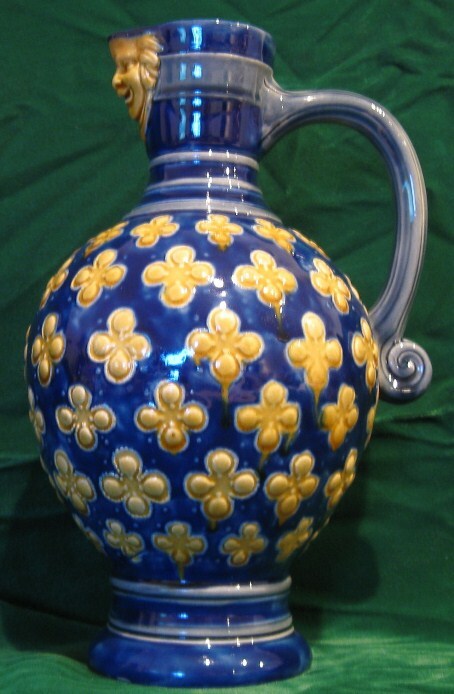 Shown below: A Minton majolica wine jug. 9 3/4 inches tall. 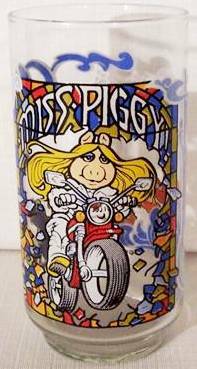 Miss Piggy Beaker – The world famous glass “celeb beaker” produced in the very late 20th century. 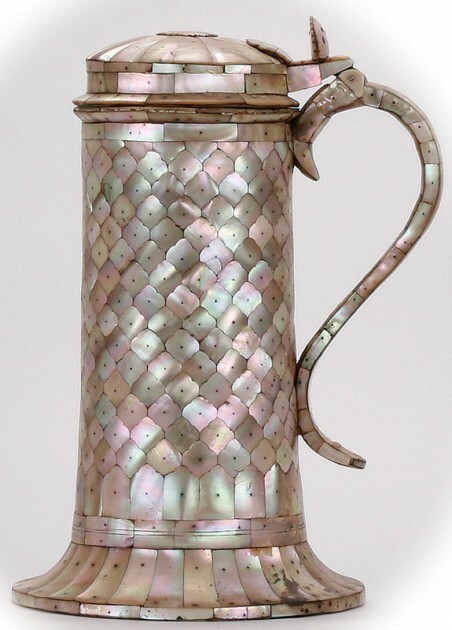 Shown below:Another example, this time copper with buffed pewter (perhaps nickel.) Deco. Dated 1911. A trophy. 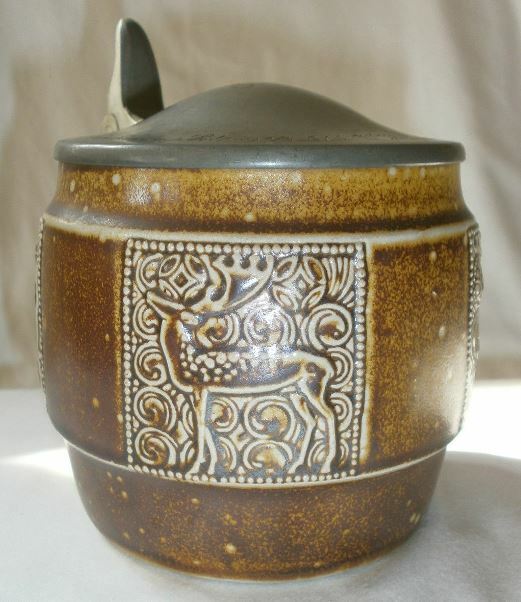 Mocha – English creamware mugs, perhaps some were used for beer or ale, but they are kind of small. Shown: One called “Cat’s eyes.” Circa 1899. 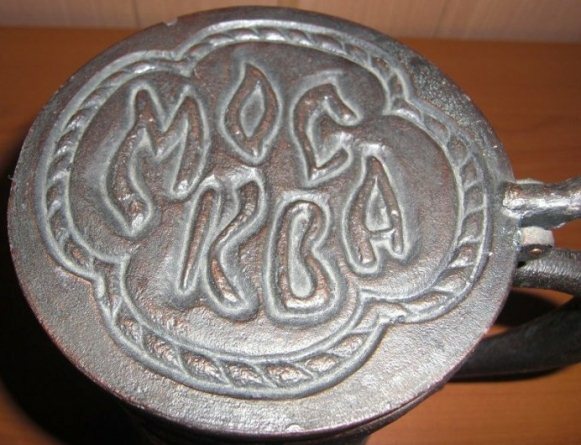 Mockba – (Russian for Moscow) – Shown: A stamped copper over zinc [?] 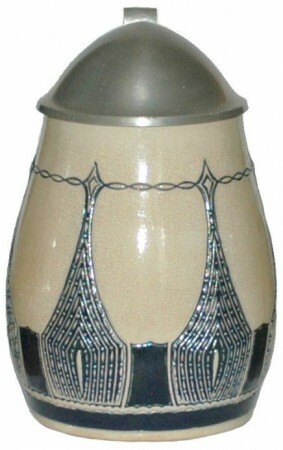 souvenir stein from Moscow City . Ca. 1900-17. 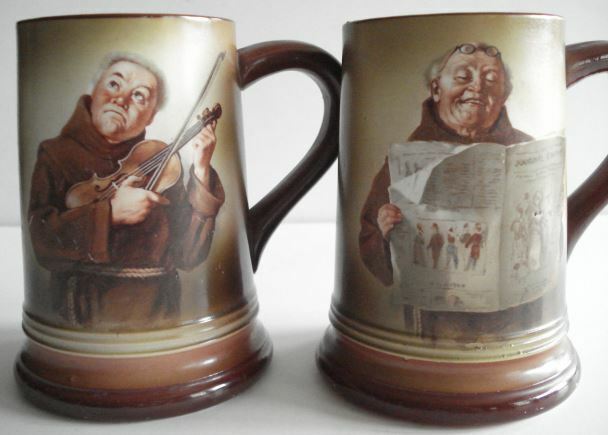 Modell steins – See “Mud steins” below. 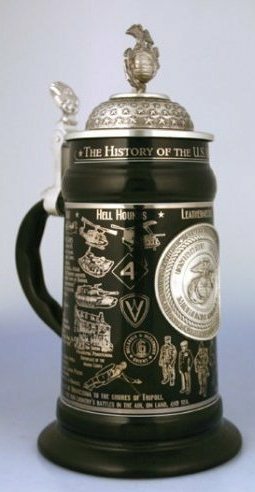 Modern steins – To the average drinking vessel collector, any stein / mug produced after the end of World War II (1945) is “Modern.” This includes those made by Franklin Mint, Avon, Budweiser, Utica Club, other USA breweries, “Limited Editions”, etc. 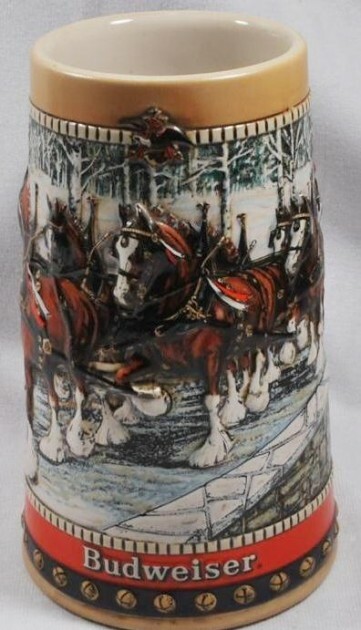 [L] Avon [products] modern pottery stein showing fishing scenes. These were non-limited editions. 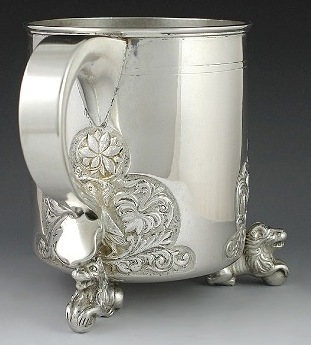 “Dumbest stein of the year” Named so by “The Stein Posse” in 2010. 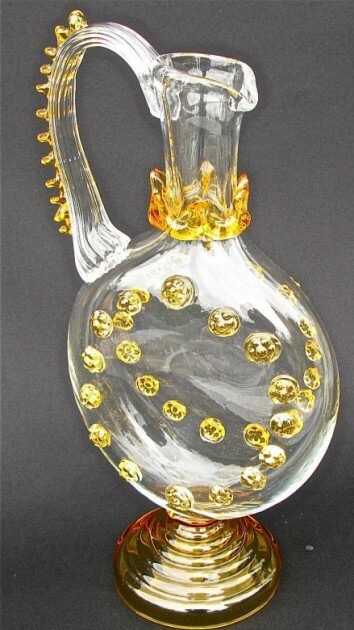 How would one ever drink from it? we all considered it a big waste of good ceramic atoms. The cost was $319.00 and $8.28 shipping. 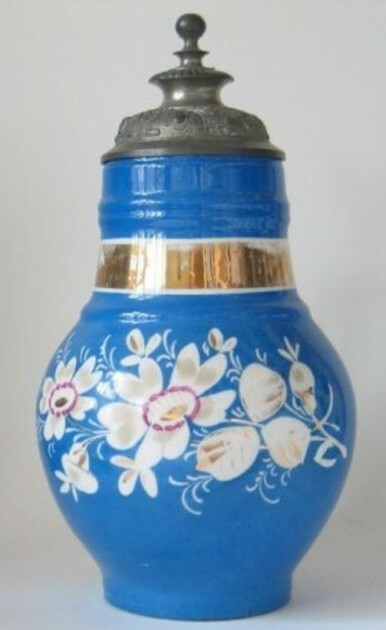 Mold blown steins (glass ) – Glass vessels that were literally blown in a wooden mold giving the piece its shape and while the glass is very hot to insure uniformity of design – usually a geometric design . This was easier than engraving / cutting and gave a quite satisfactory appearance. 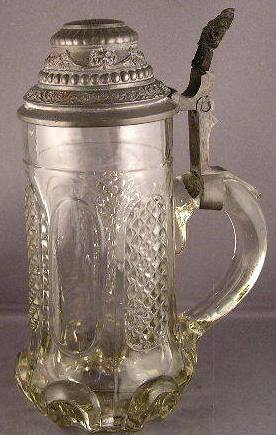 Shown above▲: One very nicely done mold blown stein with applied handle. 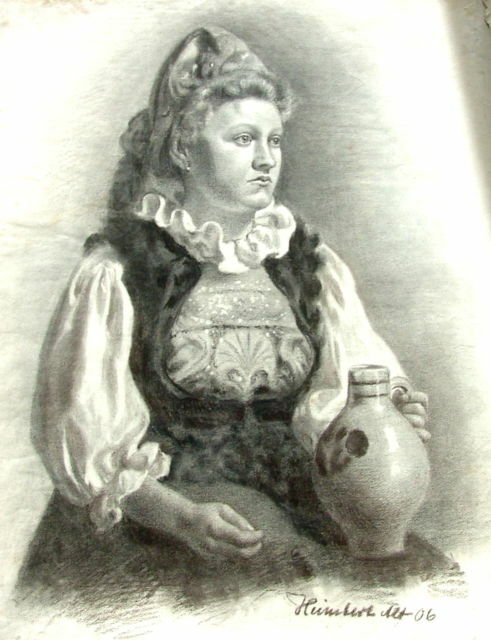 Circa 1885. If one touches the diamond cut side design, the edges will not be sharp as they are on cut glass. 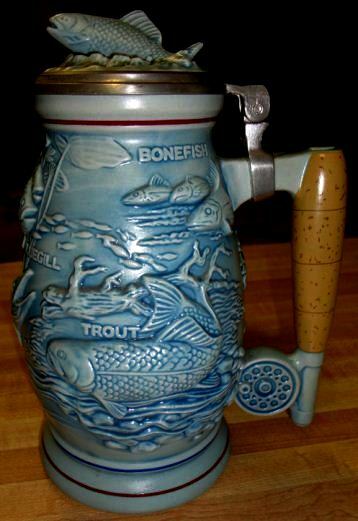 I believe mold blown stein are highly underrated as collectibles, given most of their ages. This is not the same as “pressed glass” as a lot of uninformed stein collectors think, thereby decreasing the value / cost of these pieces. 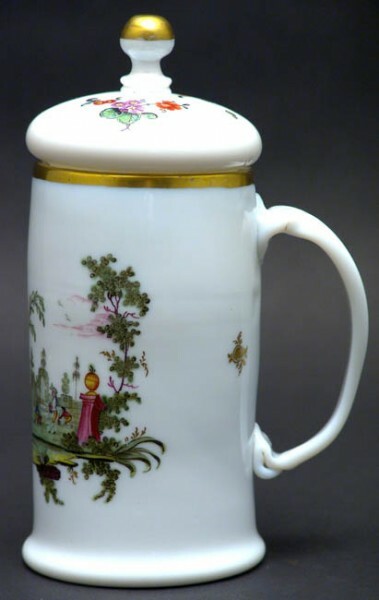 They were made from the 1830’s on, and many are found with porcelain insert lids, as shown below. 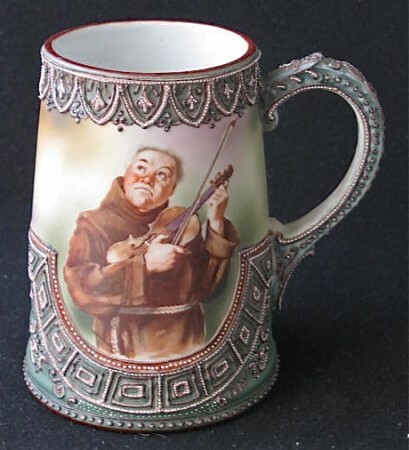 Shown below: A humorous Rosenthal porcelain “monk” mug. 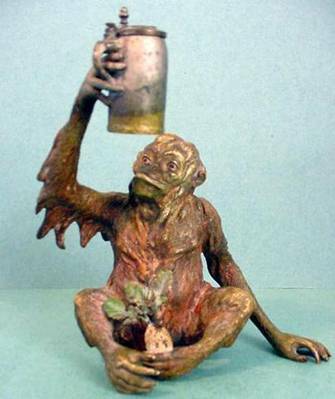 Monkey Cup, The – One of the most famous cups (actually a beaker) now owned by the MMA and shown in The Cloisters’ collection. Moon flask -A server with a full round flattened body. 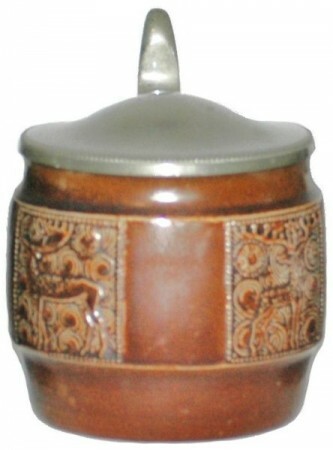 Lots were made in Westerwald stoneware wine jugs. Above▲: A more modern version done by Theresienthal Glasshütte. 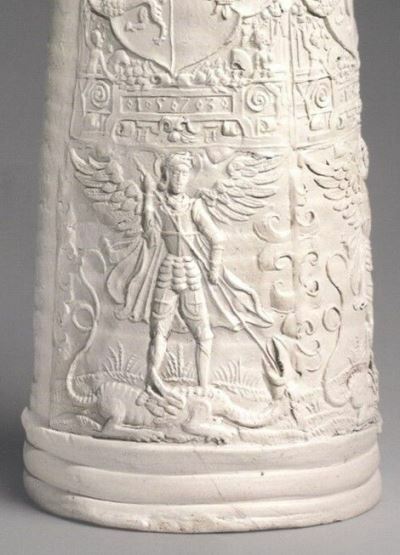 12.8 inches tall. Early 20th century . 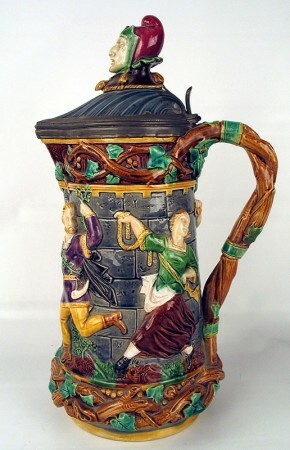 Moors Cup, or Moor’s Cup – 1.2 L Jug – Ad said: A reproduction of a so-called ‘Moors Cup’ from around 1588 from Passau. I’d like to acquire more info on the original piece. I’ve been looking for it but to no avail. Well in doing some searching I came up with this beauty ▲. A lot nicer than the pewter piece above and now I know one more thing I didn’t know 10 minutes ago. 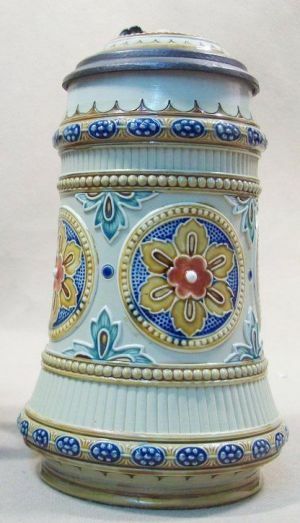 Moriage Porcelain – A style of porcelain decoration that lays beads of porcelain on the item prior to kiln firing, and then painting these later. 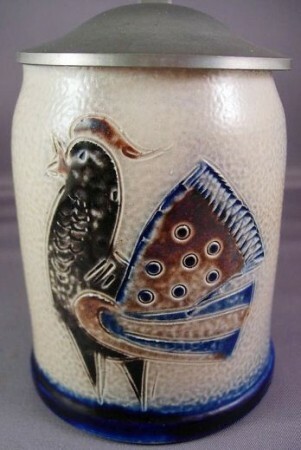 This creates a raised motif. Mory, L. – A pewter-smith in Munich about 1913 To my knowledge he made mostly contract work. 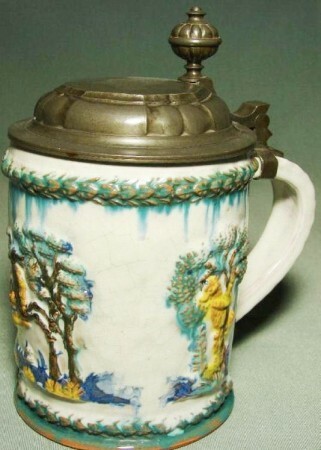 Shown ▲: A L. Mory lid on a brewery stein. Sometimes his mark is on the inside of the lid, sometimes on the shank. 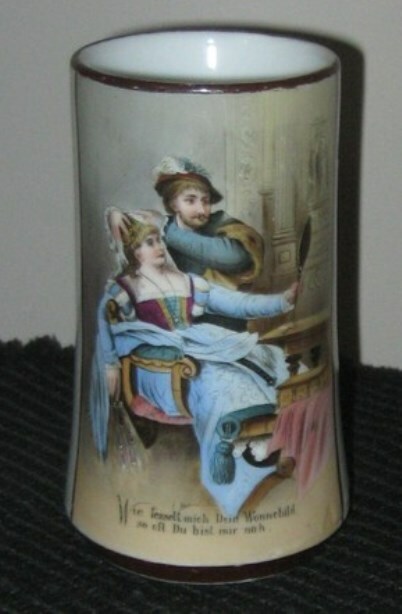 There is a later L. Mory which was his grandson who has made (Ca, 1950’s) some nice fayence reproductions such as shown below ▼. 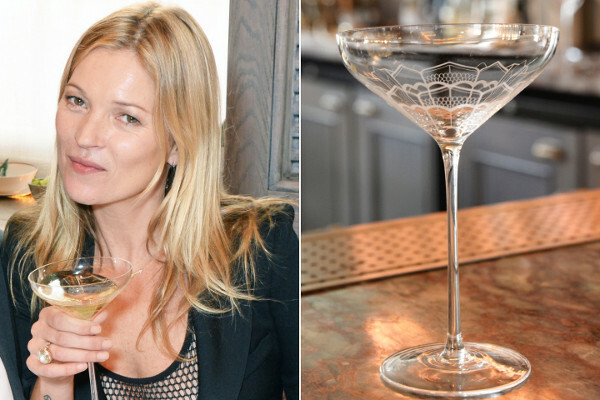 Moss (Kate Moss) breast champagne glass.- Well I guess if you are going to have one it might as well be from a celebrity [of sorts]; of course when this glass hit the shops she was then !! 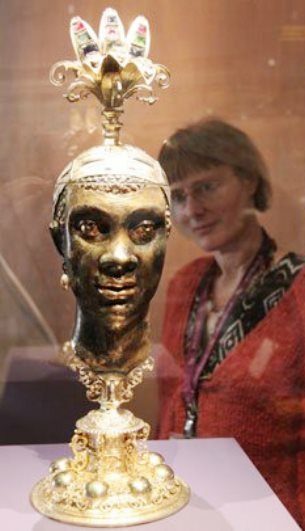 It is now (2011) still on display in downtown New York City, where the antique dealers that bought it still have it for sale. I hope they are some happy clams! 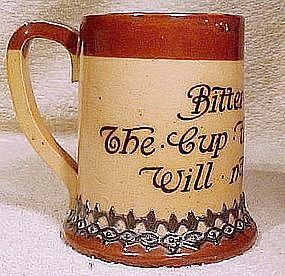 Motto ware – Drinking vessels with funny or noteworthy sayings engraved or painted on them. 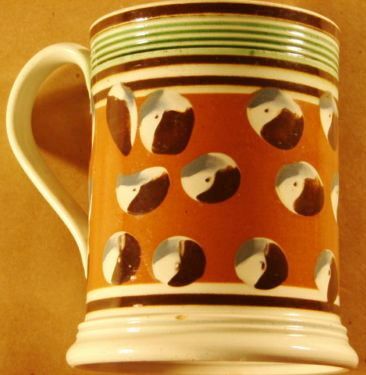 Shown: A Doulton Lambeth mug. Late 1800’s. 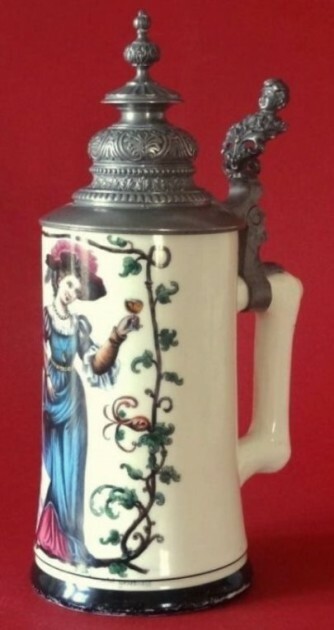 The Germans made lots of Motto ware steins with English phrases around the turn of the 1800’s to 1900’s for export to the USA. 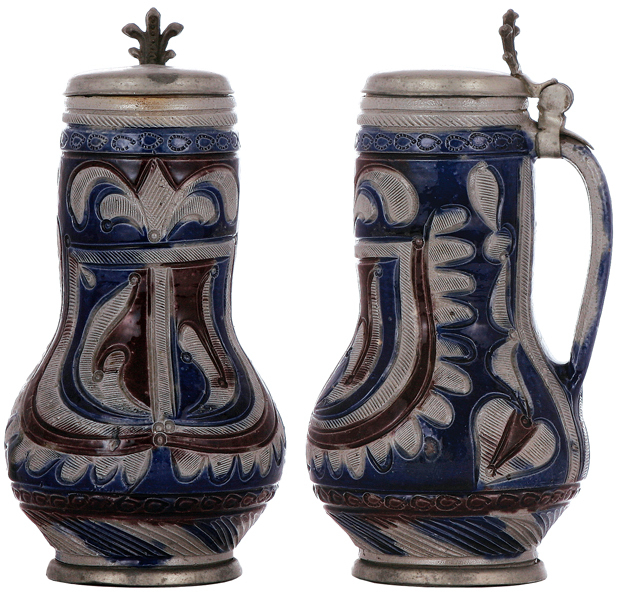 Mud steins – The Nic-name for the mostly colorless relief beer steins (gray, tan, brown) produced in the Westerwald from about 1850’s to 11890. 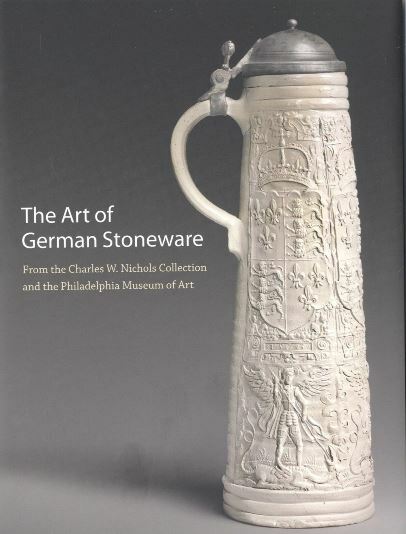 Also called Model steins (the German word). 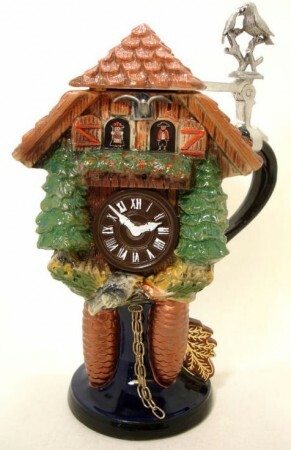 See “Regensburg,” and the tab: “The un-official catalog of mud steins,” coming some time soon [ 2014? ] to this web site. A better photo than one above and done in a different color. 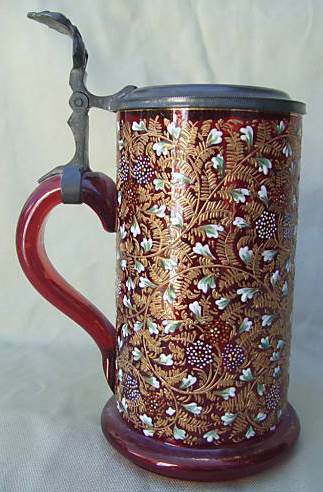 No doubt a friendship stein as all panels are standing deer. One produced by Marzi & Remy, designed by Mueller. 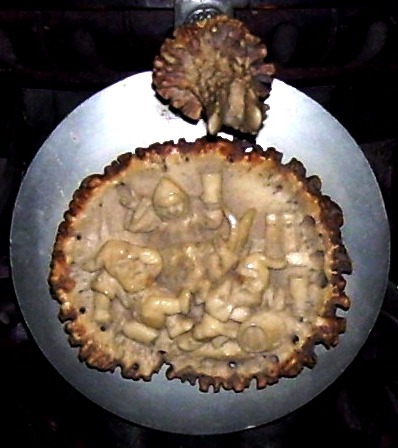 Muffle-fired — A lower temperature third firing achieved by protecting the ceramic materials from the main heat of the kiln by placing them behind muffling fire bricks, or chamotte capsules; this process made an almost unlimited range of glaze colors available. 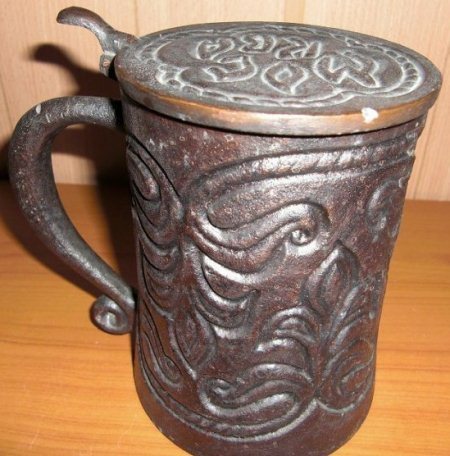 Mug – Basically a drinking vessel (a very large cup) usually cylindrical; with a handle and designed “never” to have a lid. 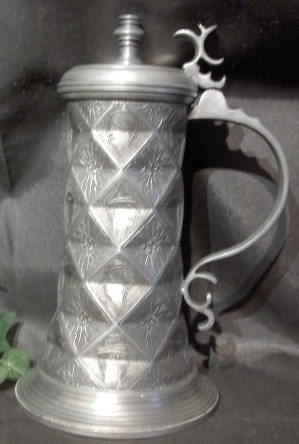 Shown ▲: A large Danish silver ‘mug ‘with a line of “peg’s” inside (Peg tankard.) Circa late 1700’s. Which has been cleaned and buffed way too much! 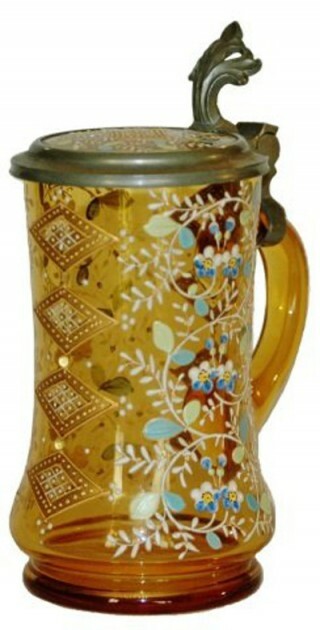 I do not know what causes it, but every time I see this modern day Oktoberfest “mug”, it just brings tears to my eyes! A couple of more of his done with the same technique. Munchener Kinde – (Munich Child / Maid ) – Above ▲: A KPM plaque showing what she does best. Also see:Munich Maid below ▼. 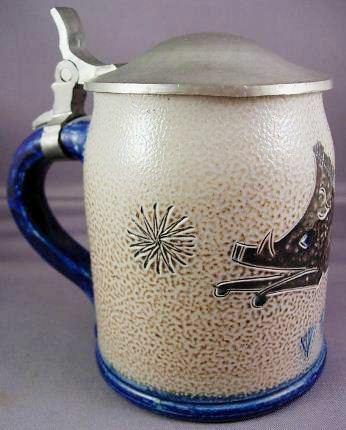 Munchener Werkstatte fur Kerramik Kunst Steins – This firm started in the 1920’s from the remnants of another firm. 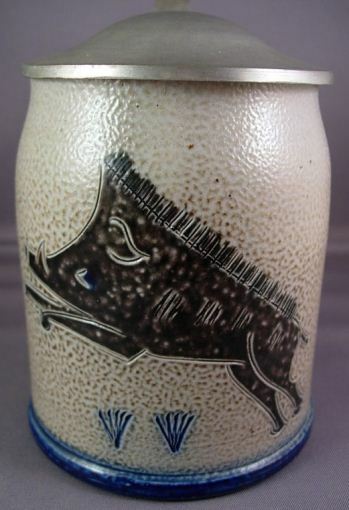 They made lead glazed wares that mimic the much older “Habnerware.” This pattern [above] with the running deer being chased was their most popular. One liter. 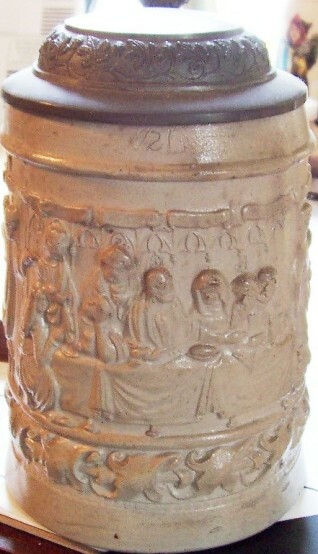 Many of their steins have niches with religious figures in front of them. 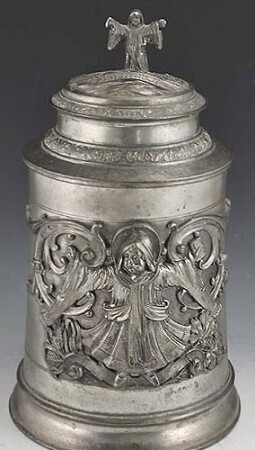 It is unknown if they made , or who made, these pewter lids, some of which are quite elaborate. 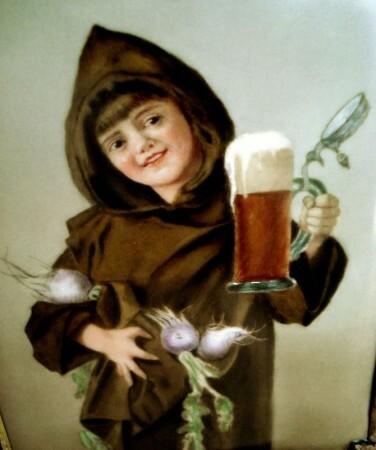 Munich Monk – The much earlier symbol of the City of Munich. 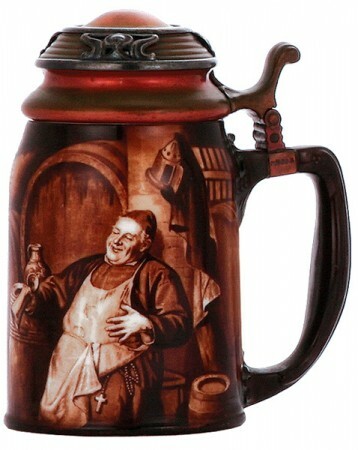 The “monk” is seen on relatively few steins from that city. Musical- this subject area covers a wide path of stein collecting which inclused intruments, famous composers, some printed well known music , etc etc I see this subject being expanded to a full page within a year or two. 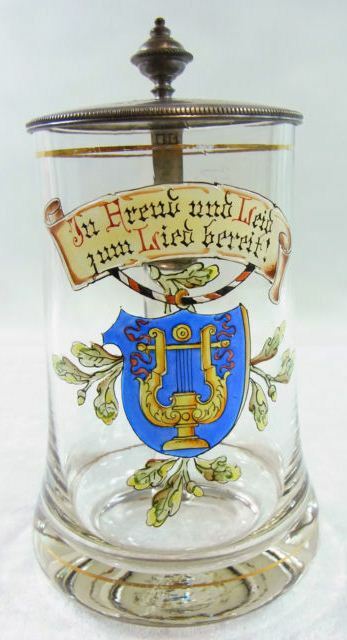 Musical Societies – These organizations were everywhere in old Germany Steins such as one shown with a Lyre /or Harp are the indicators. 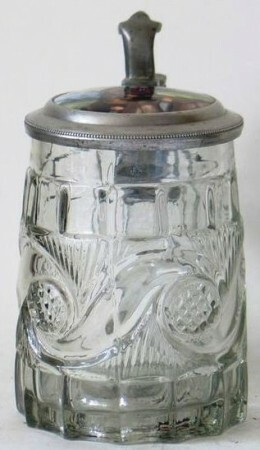 Shown above▲: Theresienthal .5 liter blown clear version with a PUG, Circa 1900 – 10. 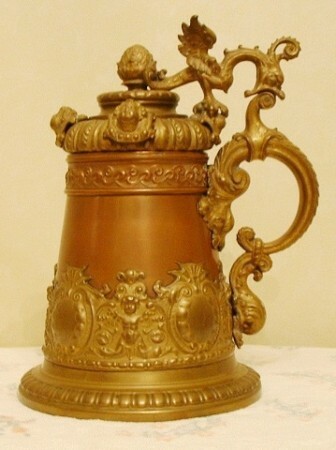 Muskau steins – Muskau was founded in the 13th century and was first mentioned in 1249. The state country (Standesherrschaft) of Muskau was the largest of the Holy Roman Empire. 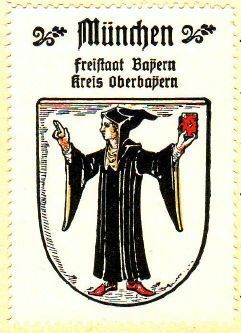 It belonged to the Margraviate of Upper Lusatia, a Bohemian crown land which by the 1635 Peace of Prague passed to the Saxon Electorate, elevated to the Kingdom of Saxony in 1806. Much of Upper Lusatia was annexed by Prussia according to the 1815 Congress of Vienna and was administered within the Silesia Province. After World War II it was divided along the Neisse River between East Germany and the Republic of Poland. About two thirds of the park came under Polish administration. In 1962 Muskau was renamed “Bad Muskau” after a therapeutic bath (spa) was built there. Shown top ▲ ▲: An 11 inch. Just above ▲: 11.3 inches. 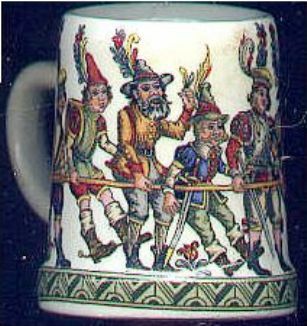 Because of the colors used, these are sometimes confused with Westerwald beer steins, yet they couldn’t have been made much farther away and still be in Germany. 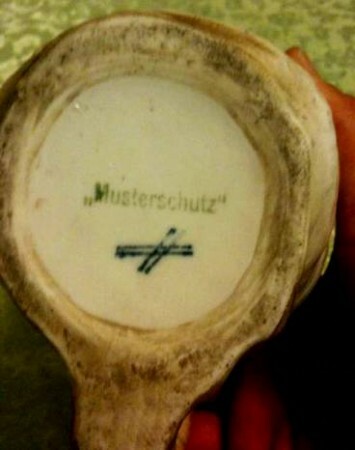 Musterschutz – German word essentially meaning Copyright Protection, or Trademark or Design Protection. It is not the signature or mark of a manufacturer!!! 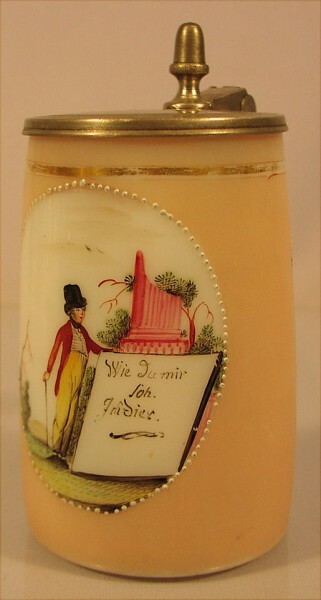 Shown ▲: The word on the bottom of a porcelain character beer stein. 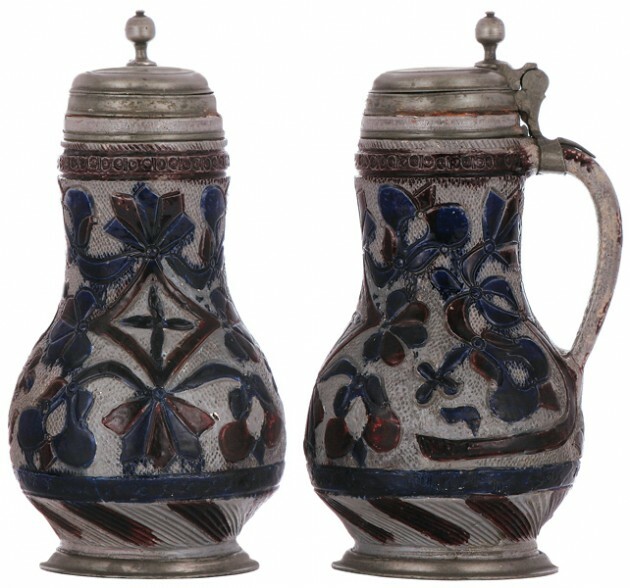 Mystery steins – Some steins just defy catagoriation eith due to their style, material made from or the makers have not been found. Body style are the same on most of these . The base colors are different; more coming soon. ▲ and ▲ ▲. 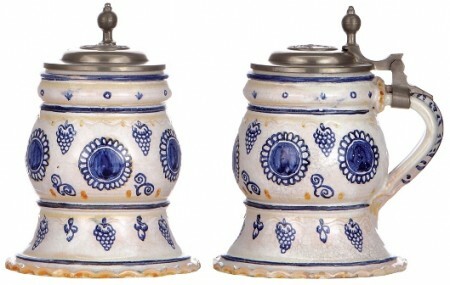 Unknown hand painted porcelain steins; most always with a bulbous bottom and solid background. I’m thinking Austrian but that is just a SWAG! Dutch Daryl and his other brother Daryl = Dutch Characters. copies of much earlier works (1600’s) made around the Dutch – French Border . Sold by himself on a differrnt seller’s page. so these are not uniquely painted as thew ones from the 1700’s were.